visible on left, top and right. 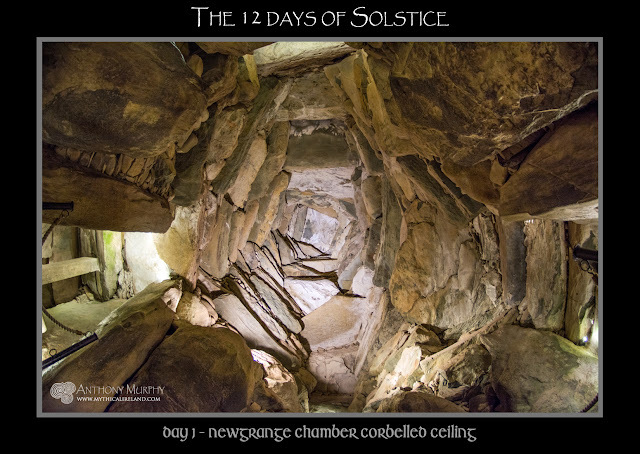 Today begins a 12-day countdown to the Winter Solstice, the shortest day of the year, which is celebrated every year at the 5,200-year-old Newgrange monument in the Boyne Valley. This year, as a special celebration of the solstice season, I am unveiling a set of images - one per day until solstice - based upon the idea of the song '12 Days of Christmas'. Because the date of Christmas was undoubtedly chosen to coincide with the ancient pre-Christian celebration of the shortest days, I thought it would be a nice idea to do something based loosely around the twelve days of Christmas. However, instead of beginning on the special day, the series of images will be finishing on that day - the Winter Solstice - with the 12th image. The series of images I have chosen is made almost exclusively of pictures that have never been seen before - with the exception of one. They show various images of Newgrange - interior and exterior - which I hope will evoke a mood of reverence for the ancestors, and perhaps an inclination towards reflection and contemplation about the deeper meanings of Newgrange, and how these might permeate into our own lives. For me personally, Newgrange is an extremely sacred and potent place. 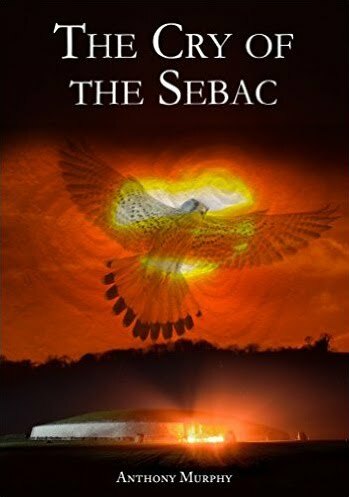 The idea - propagated in the abundant folklore and mythology of the sacred monument - that it is a liminal place, or point of access to other realms, is something that brings a deeper meaning to what it should represent for us, as individuals, and collectively as a society. Newgrange functions as a mandala of sorts. It represents a prehistoric society's vista into an all-encompassing cosmology. It represents, symbolically, the earth, but an earth that is connected intimately with the wider cosmos. That connection is dramatically played out on the shortest mornings of the year, when a blade of golden light illuminates the dark cave in an awesome display that provides, for the modern observer, a moment of profound rapture. But it represents, more than anything, an image of hope - hope on two levels. The first is the hope that we can see the light after darkness, in a physical sense and also a psychological and spiritual sense. The other is that there is something beyond this life, something out there, through the "magic window", along the pathway of light, in another realm of existence. There is much about Newgrange that is mysterious. But, when you've been there often enough, there is much that is hidden in plain sight. The antiquarians who visited the Boyne Valley monuments were, in some cases, undoubtedly looking for treasure - artefacts - things that would perhaps give them wealth and fame. However, the real treasure of Newgrange is far greater than any trinket of gold or venerated object of stone. The real treasure of Newgrange is that it can serve as a mandala for us. It connects us with ancestors, those to whom we owe our very existence, and whose struggles through the dark periods of life were not in vain. It allows us a symbolic representation of something that is beyond the humdrum of ordinary life - opening a portal for us, perhaps, allowing ingression into sacred and divine realms. Newgrange - because it has endured and is still accessible to this day - offers an opportunity to experience a rapture and an awe, a pure exhilaration at the miracles of our existence, and indeed a space in which to contemplate the deepest of life's mysteries, those which were undoubtedly pondered by the ancestors of the Neolithic. I hope you enjoy this series of images. I am very blessed to have been able to access Newgrange on many levels over the past two decades. I am, in particular, extremely grateful for the permission from the OPW that I have had to photograph its interior on many occasions over the years. I am especially thankful for having been able to witness the solstice illumination of the chamber, back in 2010. It is a very special place. I hope these photographs give you some sense of just how special it is. Anthony Murphy, December 10th 2016. A mandala, indeed. I've printed your extraordinary photo and will use it for meditation during the next 12 days. Solstice blessings to you and your family! Many thanks for this image, a mandala in itself. Stone upon stone circling high above, yet supporting the rood of the fantastic sculptural architecture. I'm definitely looking forward to these 12 days of solstice! Newgrange is always a feminine symbol to me. It represents the womb of the Mother Goddess and the light she receives at the Winter Solstice at a moment of rebirth and rejuvenation.